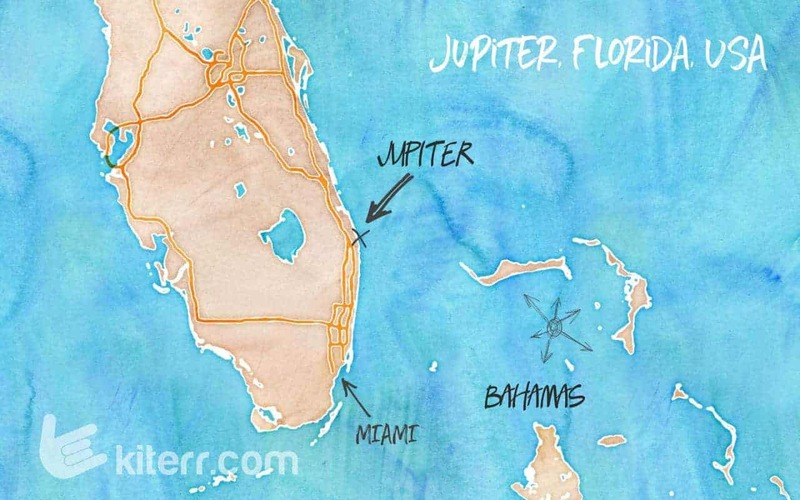 Jupiter, the father of the Gods for ancient Romans – also known as Zeus in Greek mythology, may have never set a foot on this magnificent beach of eastern Florida, but a game of fate brought him here, thanks to the confused mapmakers of the 17th century. According to historic sources, the area where the city in now located has originally taken its name by the Hobe Indian tribe. A mapmaker didn’t understand the Spanish spelling "Jobe" of the Indian name "Hobe" and copied it as "Jove". Others misunderstood the word, thinking it’s the Latin version of the god Jupiter and they transformed the name to "Jupiter". If Jupiter had seen this beautiful shore in the Atlantic, he would have surely chosen this piece of land as one of his summer residences. But anyway, enough of the story. Jupiter Kite Beach is probably one of the most popular kiteboarding spots in Florida, thanks to the wide range of wind conditions as well as other entertainment, all combined in just one small seaside town. The locals are generally very friendly and the wind conditions may not be as consistent as in other spots worldwide, but people love coming back to Jupiter for the almost all year round warm climate, crisp blue water and almost flawless kiteboarding conditions. What to expect (according to the season)? In the winter months, from November to March, you should be expecting colder fronts and breeze somewhere around 10-25 knots, while the waves will be typically mid high to over head high. If you're riding strapless, that is a real treat. The air temperatures will be generally mild around 20+ degrees celcius and the water quite warm, but if you're planning a longer session, than a shorty wetsuit will do just fine. In spring (April- June) the breeze blows from South East ranging at 10-17 knots and the air and water are warm. Small waves, but everyone can have fun. Summer months (June- July) are generally pretty hot with a light cooling afternoon breeze. The air gets to around 30+ degrees celcius and the water is warm and with almost no waves whatsoever. If you're taking kitesurfing lessons or foiling, then this is a real treat. Autumn in Jupiter can be very crazy and unpredictable. Winds could blow practically to every direction and can range from light to super strong. Renting a vehicle if you don’t already have one is the ideal choice for moving around Jupiter. There are many kitespots to discover, all pretty close to each other, but you'll need to drive to get around. You can travel to Jupiter by air. The nearest airport is the one at Palm Beach and then it’s a half-hour drive to the town, although you can reach Miami, Fort Lauderdale and Orlando and drive to Jupiter from there. It's about 2-hour drive. No wind? Or wind gone mad? Or if you just need a chilled day out of water, the town offers all the usual tourist activities, the Jupiter Inlet Lighthouse, a good selection of some pretty fascinating state parks, wildlife sanctuary and the list goes on. If the waters are calm enough, go paddle boarding. Specially popular amongst the locals these days. And for the foodies, you'll get to taste a great variety of seafood and Caribbean influenced dishes. So get out on a mission.